ZR8 League- Spring session has started! We have 68 teams currently and another division starting soon with 6-10 teams. Giving us a Spring session total of 74-78 teams playing. All divisions except for the Ofallon, Route 16, Fayette and 5th Street In House are ACS sanctioned, they opted out. Fayette and 5th Street will be ACS sanctioned in future sessions. Thanks to everyone for playing this session. TPS Events- The 2018-2019 TPS regular season has come to an end. We had 71 players participate and are now down to the Final TPS event with $538 ADDED for the 16 eligible players. Be sure to check the page for announcements, the schedule and point standings. If you would like a tournament scheduled at your favorite bar, have the owner contact us to see if and when we can schedule a date and format. Zimmerman Custom Cues (ZCC)- We are open again for minor cue repair. Please take a look at our page and contact us for your repair needs. We offer amateur level competition thru Zim's Rack 8-Ball League (ZR8), ZR8 TPS and various other sponsored and sanctioned events. ZR8 was created in 2005 and has a unique handicap system to enable all players a chance to win and win BIG! 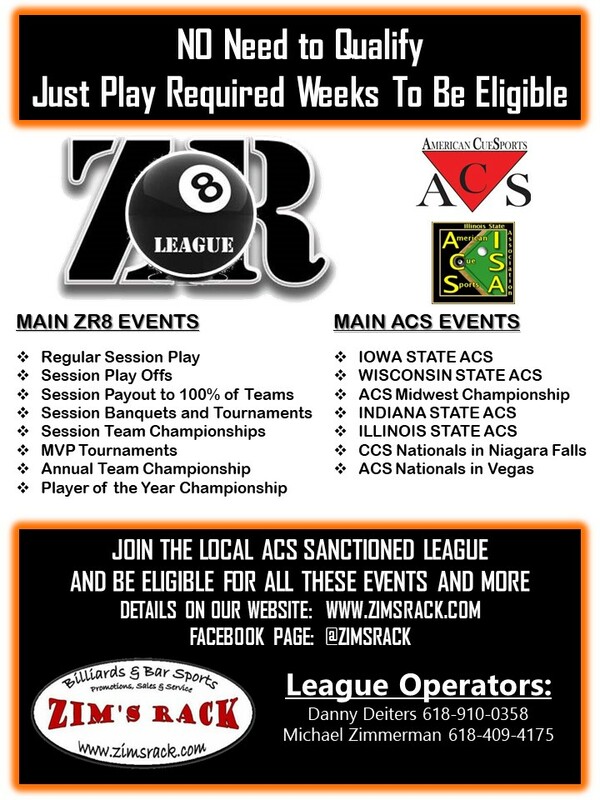 Our players are eligible to participate in the Illinois and bordering state Championships, the Midwest Championship held in Iowa and the National Championship held in Las Vegas through the American CueSports Aliance (ACS) sanctioning. In addition to competitive play, we also offer pool cue repair, merchandise, apparel and private and group lessons. You can find out more about our leagues, lessons, bar sports events, as well as purchase pool and dart supplies at our events listed to the right "UPCOMING EVENTS" or by visiting their own pages from links above. Be sure to follow us on Facebook @ZimsRack for updates as well.